Customers requested a product that would provide abundant, nutritious forage for fall and winter that grows rapidly and is extremely attractive to deer in both the early and late hunting seasons. That’s why we created Imperial Whitetail Pure Attraction. 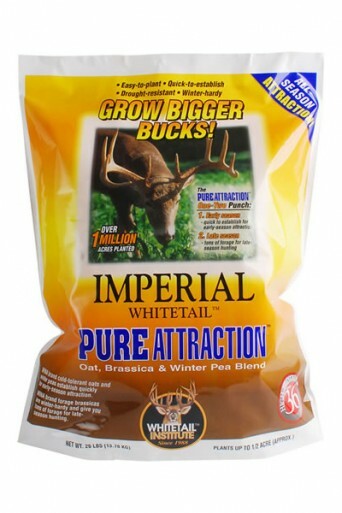 Pure Attraction’s early-season attraction and nutrition come from Whitetail Oats and winter peas. Whitetail Institute forage brassicas provide abundant forage during the coldest months of the winter. You’ll be amazed at how quickly and hard the deer will hit it. Pure Attraction establishes quickly and gives the one-two punch of early and late season deer attraction.